Tooele’s Ethan Hogan (66) and Chris Rhea celebrate a goal during Monday’s game against Ogden at Tooele High School. Hogan and Rhea have combined for five goals this season. It is the midway point of the 2019 high school boys soccer season, and the postseason picture is beginning to sort itself out. The Stansbury boys soccer team has already surpassed its win total from a year ago, and there are still four matches remaining in the Region 11 season. 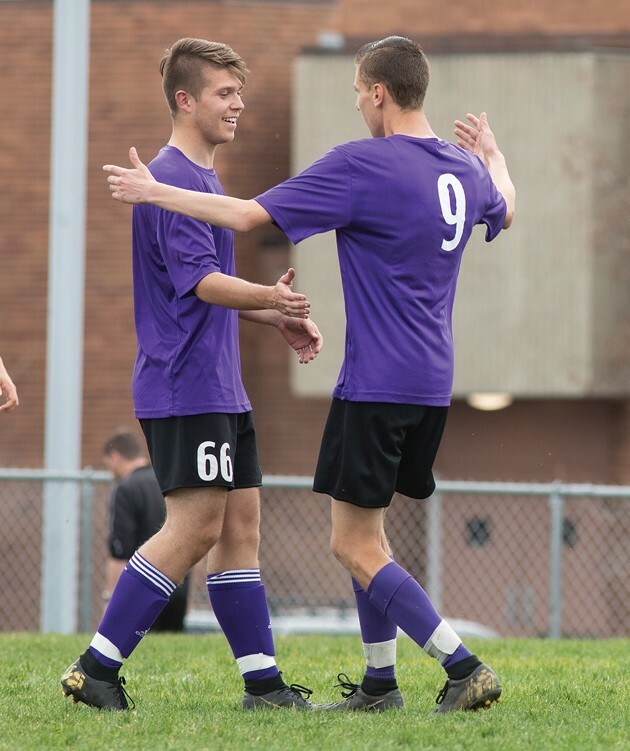 Tooele is going through a rebuilding process with a young, inexperienced roster, but has already shown signs of improvement in the second half of the region schedule by earning a 4-4 draw against second-place Ogden after losing 4-0 to the Tigers just a few days earlier. Grantsville also has a young team and is battling its way through a difficult Region 13 slate that includes several of the top teams in Class 3A. Here is a closer look at the Tooele Valley’s three high school soccer squads as they enter the home stretch of their season. Last season, the Stallions went 4-8-0 in region play and missed out on the postseason. They have experienced an impressive turnaround in 2019, having already earned four more points in the standings with one-third of the season left. A key part of their success is a vastly improved defense. Last year, Stansbury allowed 32 goals in 16 matches, including 20 in 12 region games. This year, the Stallions have allowed just six goals through their first eight region matches, and just 14 goals in 13 matches overall. While the offense hasn’t put up big numbers, scoring 17 goals in 13 matches compared to 19 goals in 16 matches in 2018, the Stallions’ goals have been timely. The three goals Stansbury scored in its two wins over region rival Juan Diego came in the final 10 minutes of those matches, earning SHS four valuable additional points in the standings. Ethan Toland has been rock-solid in goal, playing behind a strong Stansbury back line. The Stallions have been very balanced offensively, with Mitchell Holdstock, Tyler Kitchen and Dante Silvestri each scoring three goals to lead the team. Brandon Bustillos, Gabe Golden, Sam Holdstock and Israel Jones each have two goals this season. It has been a challenging season for the Buffaloes, though coach Stephen Duggan said after Tooele’s 2-0 loss to Stansbury earlier this season that he has been pleased with his team’s progress despite the lack of results. The Buffs’ draw against Ogden on Monday snapped a 19-match losing streak, dating back to last season. In 2018, the Buffs went 2-12 overall and 1-11 in region play, scoring 13 goals and allowing 55. This season, Tooele has scored eight goals in nine matches while allowing 41 — an increase of half a goal against per game. Chris Rhea is Tooele’s leading goal scorer with three. Ethan Hogan has two, and Said Ramirez, Keaton Bozart and Brendyn Gibson have each scored one. Grantsville went winless in Region 13 last season after going 7-0 in non-region action. The Cowboys are going through some growing pains this year with only two seniors in the starting lineup and three on the roster overall, and injuries have forced a number of freshmen into action in Class 3A’s toughest region. Grantsville has been outscored 42-29 this season, including a 31-5 margin in four region matches. Last season, the Cowboys were outscored 41-7 in eight region matches and 44-40 overall. Senior Dayne Linton leads Grantsville with seven goals and seven assists. Freshman Trevor Tuckett has four goals and five assists; sophomore Brayden Bergener has three goals and two assists and senior Ryan Tripp has three goals. Jose Garcia and Tanner Stettler each have two goals and an assist. Freshman goalkeeper Zach Carver has also been a bright spot, making 83 saves through his team’s first nine matches.